Hey hey! I didn't buy a lot this month because I was busy. But now that my schedule's all clear again, time for another haul post! I didn't get a lot of items but I was able to get a couple of things that I'd been planning to buy for forever. So the major item in this haul is this hair straightener I got from Watsons. It's the JML Wet Straight Pro. What I like about it is that it can be used for damp hair, hence the name Wet Straight Pro. I also ordered a blending brush from one of Char's shops, Dream Collection. Then I bought the following stuff after my board exam. I NEEDED to destress. Whew. Finally bought the famous Lorys Hair Cream. The Shea Butter variant is made specially for curly and dry hair. My hair's not curly but it is a bit dry. I hope this works! 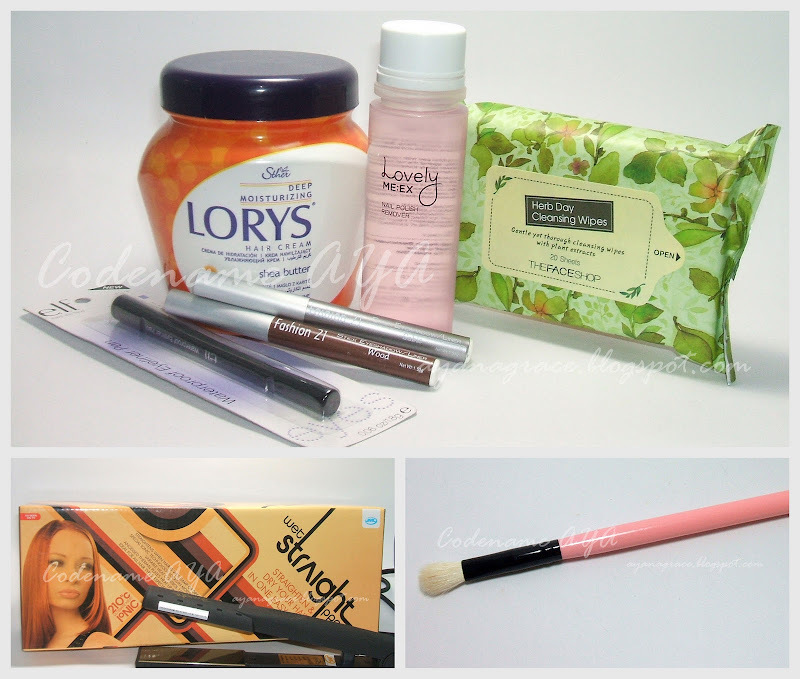 I also bought the following items from The Face Shop. I was running out of my Etude House Lip and Eye Remover but when I went to EH to buy another bottle, they didn't have any available. I bought these cleansing wipes from TFS instead and bought a nail polish remover while I was there. Now I know you know I love my Etude House nail polish remover but I've heard lots of good things about the TFS one so I decided to try it out. It's a bit more expensive than the EH one but they say the price is worth it. The EH one costs P78 per 100-ml bottle. Then I also got some eyeshadow sticks from Fashion 21. Just trying these out. I got a brown and a silver shade. Then I also bought a black pen liner from ELF for when I'm just too lazy to apply gel or liquid liner. I actually also wanted to buy a brown shade but the label on the cap sticker said "Cooffee" instead of "Coffee." I checked the other label and it said "Coffee." So I didn't buy it. Shouldn't there be a spell-checker or something? Spelling and grammar boo-boos on product labels are a turn-off. i didnt try yet the EH products because it is not available here but i try the TFS makeup wipes and nail polish remover and i loveit!! hope u like it too.. I love ELF's liquid pen liner-saves me more time and it's easy to use i swear! Love Love Love your haul posts and tutorials! I'd love to see a review of the eyeshadow sticks! Nice haul, Aya! How was the Lorys Hair Cream? Is it good and effective? Hey there.. i just wanna ask.. does your wet straight pro also acts like this: when it is too hot and you turn it off you wont be able to turn it o unless it cools off.. maybe after 15 to 20mins..